Kidz Haven is a warm and loving in-home childcare with the same benefits as a preschool center. It is an extension of the home where children can feel loved and accepted and have a sense of belonging. Each week holds a new learning experience as we use age-appropriate materials combined with flexibility in the day’s program. Kidz Haven would be their ‘home away from home’ where they will receive positive guidance as they freely explore their world. Provide a safe and nurturing environment where children can physically, emotionally and socially reach their fullest potential of growth. Engage in fun, child/teacher directed play that stimulates experimentation and exploration. Develop a love of learning by providing creative, hands-on activities that will cater to individual learning styles. 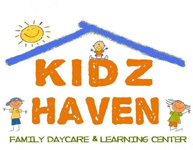 We thank you for considering Kidz Haven for your childcare needs. Sorry, we are at FULL CAPACITY at this moment. Please fill out our Waiting List and we will contact you for a tour/meeting should a spot become available. In the meantime, please browse our website and view our photo gallery to get to know more about us. Thanks!